A spry contender has entered the ring this summer in the debate over the origin of birds. Its body may only be a few centimeters long, but its wings pack a big punch. The only problem is that its rival, a heavyweight champion, hasn’t even put on its gloves. Some experts are putting their money on a 220 million-year-old fossil, whose stalky plumage may be the oldest feathers ever discovered. The fossil provides a rallying point for a small group of iconoclasts who disagree with the mainstream theory that birds evolved from theropod dinosaurs — bipedal carnivores including the infamous velociraptors of Jurassic Park. Scientists who believe birds are the descendents of theropod dinosaurs are the odds-on favorite and demand a worthier opponent before they’ll consider a match. The fossil, Longisquama insignis, was part of a collection on tour in the United States from the Russian Academy of Sciences’ Paleontological Institute in Moscow and was originally found in central Asia. John A. Ruben of Oregon State University led Terry Jones, his graduate student at the time, and a team of Russian and American scientists in carefully describing the tiny animal’s jetting appendages for a report in the June 23 issue of Science. The authors and their theropod-bird linking adversaries agree the animal is not a bird or a dinosaur but rather a reptile with wings. theory that dinosaurs led to birds. But the authors argue “it has all the characteristics of feathers,” says Jones, now of Stephen F. Austin State University in Nacogdoches, Texas. And the unique characteristics of feathers, they say, were unlikely to have evolved more than once. Still, before they step out of the locker room, the heavyweight theropod advocates are waiting for their opponents to answer one question: What are the ancestors of birds if not theropods? For example, “if they said that Longisquama is more closely related to birds than to all other known creatures, than at least we could hypothesize that these elements are the ancestral condition of feathers,” says vertebrate paleontologist Thomas Holtz Jr. of the University of Maryland. Others agree. “Methods, standards of evidence and testable hypothesis are the business of science, and these guys aren’t with it,” says Kevin Padian, professor of integrative biology and curator of the Museum of Paleontology at the University of California, Berkeley. He compares the debate to the early challenges of plate tectonics. “After a while, geologists accepted that the continents move, even though some still disagreed, and the field moved on. It’s way past time to do that with bird origins.” He’s been waiting 25 years for the ‘diehard’ opponents to point out a better ancestral link to birds than theropods, he says. 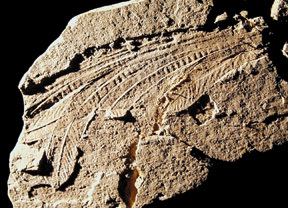 Longisquama’s place in the family tree is still a mystery, but it offers the first clue to what feathers may have looked like during the Triassic. If indeed its structures are feathers, then its plumage predates the feathers on the oldest definite bird, Archaeopteryx, by 75 million years. Previous workers had named Longisquama after its “long scales” but it has many of the modern features that define feathers, Ruben says. Each structure is distinct with a midline shaft projecting fine, comb-like barbs to either side. The bases of the shafts have a hollow quill similar to that of modern feathers and evidence of having developed within a follicle. However, there are differences between modern feathers and the fossil appendages of Longisquama. The gliding reptile is missing the Velcro-like connections that prevent the fluffy ends of feathers from separating. Instead, it has “a sort of ribbon connection that goes around the feather,” Jones says. The wings also protrude from the creature’s spine rather than its forearms. The authors consider the differences early steps on the evolutionary path towards birds. “For a Triassic animal, it’s amazing we got as many characteristics as we did,” says Larry Martin of the University of Kansas. Vertebrate paleontologist Holtz calls the new interpretation of the elongate structures “interesting,” but lacking the hypothesis needed for a real challenge to the theory that birds evolved from theropods. It would be better, he says, if the authors couched their hypothesis in an explicit framework of patterns relating to common ancestry. Maybe then he and his colleagues will be ready to enter the ring.